Alligator Point: Bayside launching is great on a northwest wind for slalom or bump/jump. Gulfside launching on a southwest can provide small waves and shorebreak. Parking and rigging area just east of the marina. St. George Island: (launch off the causeway for flatwater sailing and on the beachside for waves). Good camping in the State Park (904) 927-2111. Hot showers. Cape San Blas / St. Joseph's Peninsula: Next to Port St. Joe, 1 hr. E of Panama City. 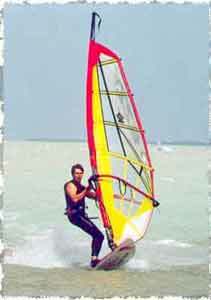 Flatwater windsurfing on the bayside and wavesailing on the gulf side. Launch from beach parking lot inside the State Park. Excellent camping in the State Park. Hot showers (904) 227-1327 . NOAH station on WWW (see weather URLs below). Panama City (Alligator Point and State Park): Camping in the State Park. Hot showers. Grayton Beach (State Park and beach front in town): Few flats, mostly wave sailing. Camping in State Park. Hot showers. B&B in town. Voted #1 Beach in US, by people who know. (904) 231-4210. Ft. Walton Beach: Flatwater saining in the bay, waves on the Gulf front. Small windsurfing store. Hugenot Park, Jacksonville: From the airport, take 9A (east-bound extension of I-295) to exit Heckscher Dr. Take Heckscher Dr. eastwards for about 20 minutes (past the Mayport ferry). The park has designated facilities for windsurfers in a small bay and beach-front access for wave sailing. This is the preferred sailing site of JAWS (Jacksonville Windsurfing Club). Cheap camping right on the bay, but tents may be exposed to strong winds. Hot showers. WindTalker: (904) 251-3674. Better wave sailing from Mayport Naval Station. (Show your id at the gate and claim that you want to meet someone at the Officers' Club. Hey, that's what the locals do.) Microbreweries: Rag Time on Atlantic Blvd. almost at the Atlantic (easy access from Hugo Park via Mayport ferry), Hops (Mandarine), River City Brewing Company (Museum Dr., downtown). Also check out the European Street Restaurant on Park St. for draft imports. Anastasia State Recreation Area, St. Augustine: Take A1A south out of town and follow signs. Designated windsurfing area in a small bay with old rental facilities. Wave sailing possible. Camping in the park. Hot showers. NOAH station on WWW (see weather URLs below). Daytona Beach: Flats on the intercoastal waterway, waves at the Atlantic beaches (drive on the beach for a few $). Windsurfing store: Sandy Point (very good selection of new & used stuff, demos, rentals, expert advice) 3109 Ridgewood Ave. (904) 756-7564. 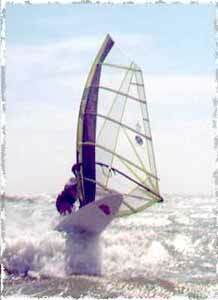 You can also launch at Sandy Point and will often find others to sail with there.